Are you suffering from a toothache and even when you take the strongest medicine available to you, you are still hurting? A lot? Are your gums swelling from a toothache? Is it time to figure out why your toothache won’t go away? We are here in Derry NH to help if you have a toothache or feel you need a root canal in the Londonderry area! 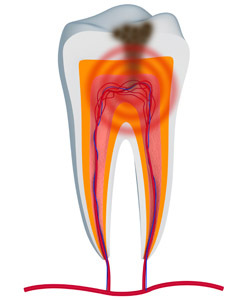 A root canal is performed when you have decay in your root pulp that gets infected. The infection is the toothache. But sometimes, root canals aren’t always accompanied by pain. When you had baby teeth, root pulp was a necessary part of your tooth. It encouraged the growth of your tooth. But once you got your adult teeth, the need for root pulp became obsolete. When root pulp becomes infected, your family dentist will suggest getting a root canal. Root canals are clearing the infected root pulp out of your teeth, placing some antibiotic medicine in the cavity and then placing a dental crown over the tooth to make sure there is no more chance to have the tooth become decayed again. Root canals used to be synonymous with a huge amount of pain, but now, with modern dental technology, your toothache probably feels worse than the root canal procedure to eradicate the toothache! What are the symptoms you should look for that would indicate you need a root canal? A toothache that doesn’t subside, especially if you have taken medication. A tooth that has obvious decay. A tooth that has lost a filling or other dental work, or that dental work is loose. A pimple on your gums. Severe pain when you eat or drink something hot or cold. We want our root canal patients in the Windham NH, Derry NH and Londonderry area to feel pain-free and not suffer from a toothache. If you have dental anxiety as well, please know that we offer several varieties of dental sedation you can access if you need a root canal. Call us in Derry NH today! Suffer no more!